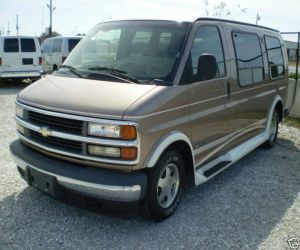 This 1999 Chevy Express 1500 has a 5.7 Chevy V-8 gasoline engine and an automatic transmission. It has power steering,tilt and cruise control to make the drivers experience nicer. This Chevy van has tan carpet and tan leather seats. The two front rows are captain style while the third is a 3 person seat. The middle section of sets can be removed and the back row is a small power fold down bed. Above each seat is a personal reading light. A small TV is installed in the front of this van and come with a VCR to make the trip go by a little faster. It also has an AM/FM/CD/Cassette player in the front dashboard. Every window is covered with a privacy blind. This Chevy vans exterior is painted gold. It has three doors that all pull open. Another door is located in the back and when opened there is access to a small storage area. Four large windows make up most of the back on this van. Getting into the Chevy Express is made easier by small footsteps attached under the doors.